While people think of today's camels as restricted to the dryer regions of Asia, the earliest camels evolved and lived in North America. 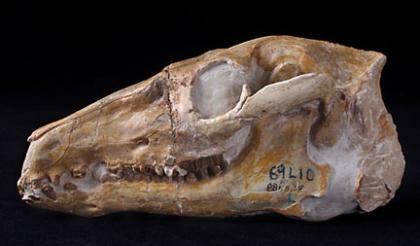 This skull of Poebrotherium dates back 35 million years. The animal differed from modern descendants in having small hoofs instead of pads on its feet, but many characters of the teeth and limbs are similar to camels today. There is no evidence these ancient camels had humps and they probably looked much more like another member of the camel family living today - the South American llama.